Kevin Hart stepped down from his Oscars hosting gig last month following the controversy over his years old anti-gay tweets. He apologized for the old (and now deleted) remarks, but concluded that the best plan of action would be to step away from the Academy because he didn't want to make the awards show about him. NBC talk show host Ellen DeGeneres, a well known LGBT activist, invited Hart on her show for a frank discussion over the controversy. The interview is set to air on Friday afternoon, but the host shared a few clips beforehand. 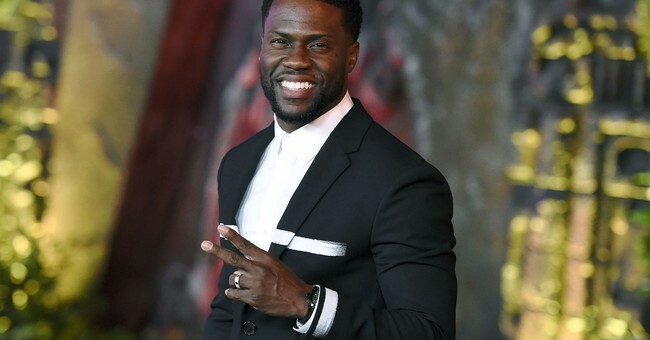 In the interview, Hart notes how hosting the Oscars was on the top of his list of goals, especially because he would have been only the fourth African-American comedian to do so. He was also excited to make Oscars night "fun," because the room is usually so tense and uptight. Yet, he regretted that he didn't even get a full 24 hours "to glow in the glory" of the achievement before being hit with an "onslaught" of social media hate about his past. His first instinct, he said, was to "ignore it," because it's something he had already addressed. But the media ran with the headline that he refused to apologize and he began to get upset. "I know who I am," Hart said. "I know I don't have a homophobic bone in my body." Hart added that he's acted upon his apology in the past decade and that he's not "the immature comedian he once was." He's unsure who this "perfect person" is that society is demanding, but it's not him. DeGeneres thanked Hart for having the conversation and for realizing his language was offensive, before encouraging him to take his rightful spot on the Oscars stage. “As a gay person, I am sensitive to all of that," she said. "You’ve already expressed that it's not being educated on the subject, not realizing how dangerous those words are, not realizing how many kids are killed for being gay or beaten up every day." She apparently even called the Academy herself to advocate on his behalf. "I called them, I said, 'Kevin’s on, I have no idea if he wants to come back and host, but what are your thoughts?' And they were like, 'Oh my God, we want him to host! We feel like that maybe he misunderstood or it was handled wrong. Maybe we said the wrong thing but we want him to host. Whatever we can do we would be thrilled. And he should host the Oscars.'" Yet, as always in our culture, there were critics who torched DeGeneres for giving Hart a platform and, worse, for giving him forgiveness. Some even accused DeGeneres of betraying the LGBT community and giving homophobes a "pass." If Hart does not end up getting the gig, here are a host of other Hollywood figures who I think can get the job done.